....but the SOI is still creating a persistent "mid winter like" large area high pressure cell over Aus for the 10 day outlook. Need to be patient, (I reckon the sea temps up Broome/Darwin way are promising) ...but meanwhile the fire conditions for Gippsland/E Gippsland continue to threaten a bleak summer. I guess we sit back and enjoy a couple of days of sunshine, then wait for about a week until something brews up over in the west? 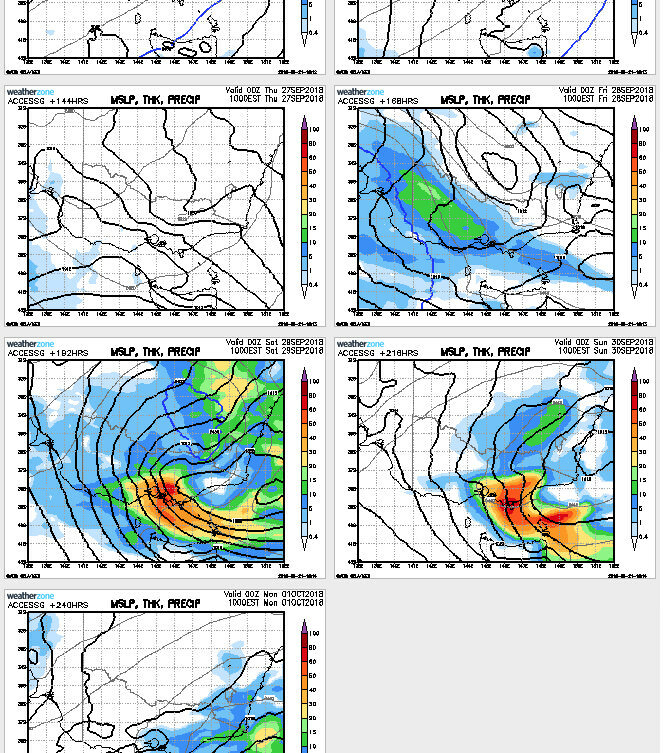 Still nothing in the 10 day models other than a few systems clipping the south west. This is the ACCESS 10 day total rainfall forecast thru to the 20th. Really need something big in the last 10 days of September or we will be seeing some significant rainfall deficiencies. The cold nights still keep going average 1c to 8c, just want mild night of 12c would be nice and no more gas heating..
Local BOM - snow above 700M, be coolish, Max 16C Sat and 14C Sun. Felt Spring out N of Maffra yesterday, saw 24C. Hope next front bring rain, as bit worried that NW WA is heating up sensitive ready to slip any warm to hot into SE Australia easy follow NW to SE jet-stream. Sale Met office mentioned that storms might accompany the change as it crosses Gippsland during Saturday. Looking at the EC and AccG 10 day runs, looks to me after this present, and subsequent mid week high cells pass over the continent; that successive highs look to be more centred over Aus S coastline by next weekend. Hopefully a new phase of the southern oscillation index? This should allow moisture from the NW to add fuel to the late September frontal systems and kick off the storm season? 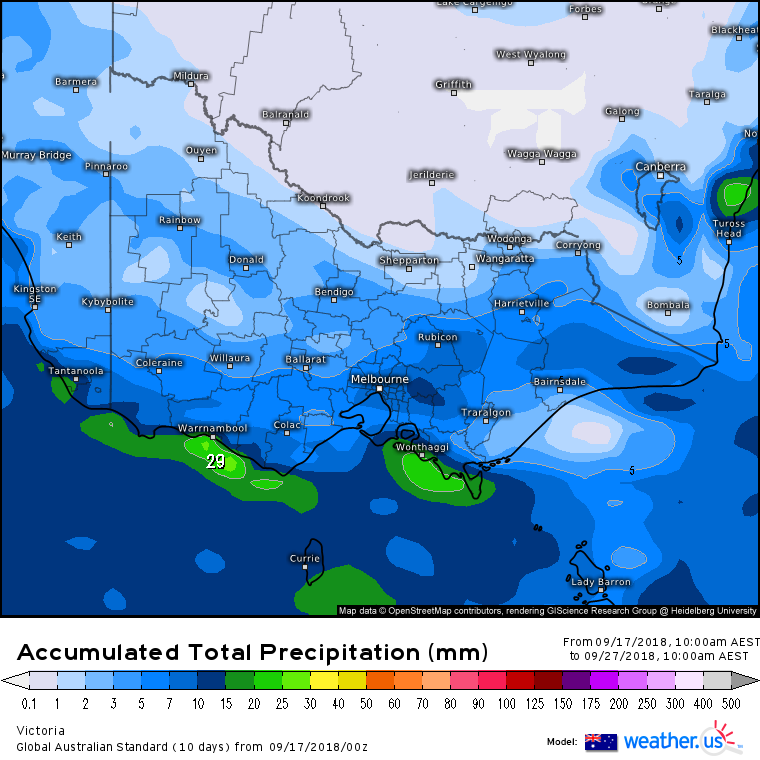 If this prove to be a reality a massive number of Vic stations will be smashing lowest September rainfall records. ....ta logansi - and I can vouch that Maffra is definitely a contender. Note that SW Victoria is now has some of the largest differences after have an average to above average winter unlike the rest of the state - different concern re fire risk with high grass growth likely. Victoria likely cold nights until October is likely when mild night temperature to reach average 10c to 15c night time. A cold start here again today, no frost, but delaying the spring growth all the same. The models are now centering the high pressure systems much further south in the outlook - breaking us from a prolonged winter period of large systems centered over mid Aus which lingered for much longer than usual imo. Next MJO pulse over the Indian Ocean in less than a fortnight time might herald a wetter period for Victoria. 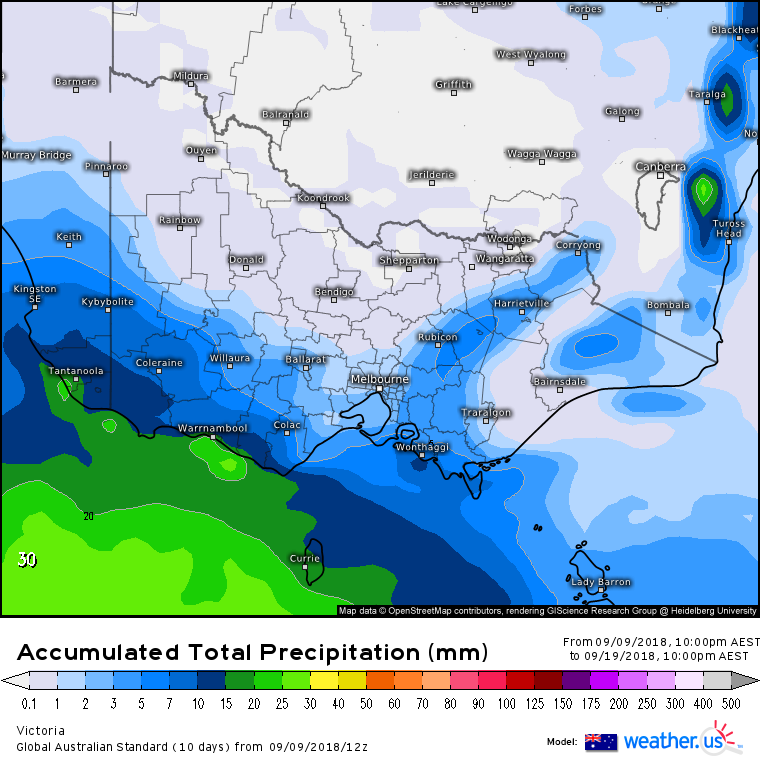 If charts dont change too much then Gran Final Day will be horrible showers and windy cold..
Grand Final Day will be horrible showers and windy cold..
Looks like a showery period looming for Vic's southern areas later next week/next weekend? .....circa 3-6mm totals only. 4 registered (Mike Hauber, Sandbank, Multiversity, Homer), 61 Guests and 4 Spiders online. Generated in 0.039 seconds in which 0.022 seconds were spent on a total of 14 queries. Zlib compression disabled.